Facebook has always been a fast grower, but the fact of the matter is that the social media platform had to slow down sooner or later. This is because of the fact that there is a limited number of people in the world, and now that the social media platform has over two billion people there are not many places left for it to go, especially when you consider that there are less than four billion active internet users in the world. This along with a bunch of other reasons is why Facebook’s user growth rate has begun to stall and even decline in certain parts of the world, and Facebook is definitely feeling the burn. The fact of the matter is that Facebook is losing users in North America, which is its most valuable market. The average revenue per user in North America was about thirty five dollars last quarter, and it was only three or so dollars in other markets around the world. 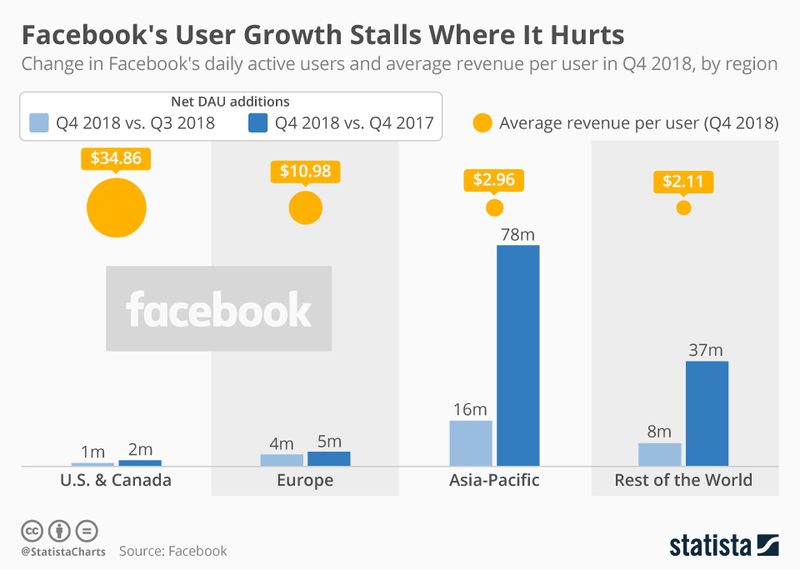 That being said, Facebook is seeing a fair amount of growth in the Asia Pacific region, so it is important to keep this in mind when ascertaining the future of the internet juggernaut.